Miami Japanese Festival will be huge this year! Free Miami Japanese Festival is going to be the biggest ever this year! 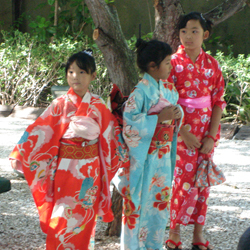 Free Miami Japanese Festival – Miami’s Ichimura Japan Garden celebrates the traditional Shichi Go San Festival for children. This is a coming of age ceremony for 3, 5 and 7-year old children. A martial arts demonstration and Ikebana demonstration will highlight the day. Japanese drumming, paper theater and magi, plus food and gift shop. The garden is free and open to all to enjoy. This is one of Florida’s hit cultural festivals! Martial Arts, Magic, Music & More. All Free! Master Magician Shoot Ogawa headlines the Free Festival January 26th at Ichimura Miami Japanese Garden.Plus, there will be a full Martial Arts demonstration by World United Karate Organization World Champion Paul Danos. In addition, “Kia Kidz” students with great exceptionalities will be showing off their martial arts skills. Listen to the exciting Taiko Drummers and learn Ikebana, the Japanese Art of Flower arrangement from Grand Master Mieko Kubota. Enjoy Japanese games, arts and crafts at the Children’s Corner.